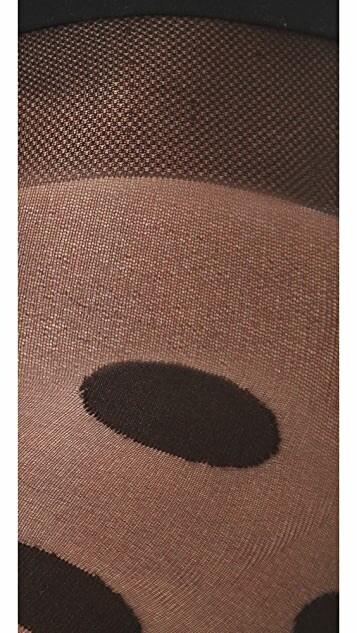 These sheer tights feature a polka-dot pattern and a seamless, opaque jersey waistband. * Legs: 89% nylon/11% spandex. The dots on these caused them to snag on things and they got immediate runs. Disappointing as they're so expensive but I would buy Commando again, just in a solid unpatterned nylon. The quality of the stockings was gorgeous. A bit too tight so the dots are streched; not good if you are not skinny. :( take size bigger. fits perfectly and amazing quality! I got many complements when I wore these tights. I have accumulated 4 pairs of Commando tights in just 2 weeks - I can't say enough about them. They are super soft and comfy, they fit my thin legs perfectly (an issue with smaller and shorter woman) and while these are a bit more delicate - they are worth it as I need a couple of dress up pairs. I am 5'9 and it is often hard to find tight long enough. The tights fit perfectly, and the polka dots don't stretch out and look miss- shaped. I love wearing them to make my outfit a bit edgier! These tights are very cute and I was able to wear them only one time before they got a huge run in them and I had to throw them away. My tights from KMart have lasted a whole year with no runs and these lasted one wear. Would not buy this brand again only because of the quality. The look and style are great but unfortunately they did not hold up for me. I would be very cautious wearing these tights so as to not get any holes in them. They are extremely delicate. exactly what I have wanted but hadn't been able to find! Thanks shopbop! Really cute and comfortable...I wore them once and got a zillion compliments! !